Internet Archaeol. 25. Williams. Satellite imagery. A high-resolution panchromatic IKONOS image of the study area was acquired by the project in April 2001 (Dare and Ziebart 2001; Dare et al. 2002; Ziebart et al. 2002) (Fig. 14). In support of this Global Positioning System (GPS) work had taken place in September 2000 by Peter Dare (University of New Brunswick) (Fig. 15), to establish a control network linked to the International Terrestrial Reference Frame (ITRF). Observations were made at a series of base points for between 2 and 10 hours, while points in the NW and SE of the area had observations carried out over a 6-hour period on one day to improve the ITRF link. The ITRF also ensures that the co-ordinate system can be re-established in the future, should the physical monumentation be destroyed. 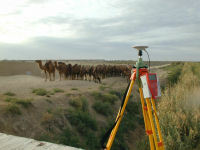 Figure 15: The Lecia Global Positioning System (GPS) set up to establish a control point on one of the modern road bridges near Merv. The imagery was supplied by the vendor, Space Imaging, in ERDAS IMAGINE format, approximately positioned in the Universal Transverse Mercator (UTM) zone 41 co-ordinate system. In order to improve the accuracy of the position of the features visible in the scene further processing of the registration was undertaken by Peter Dare, and then by Marek Ziebart and Cordelia Hall (Department of Geomatic Engineering, UCL). In the process of registration the position of several points of detail, visible in the imagery, are determined accurately in an appropriate co-ordinate system. The positions of the points are then used to calculate a mathematical transformation, mapping each pixel in the raw image to its equivalent position in the registered image (Ziebart et al. 2002).